We rode The Lot tonight and it was bone dry. We tried to smoothen some stuff out and work on the landers but the dirt was just crumbling away and turning into powder. Damn we need some rain!..and it looks like it is coming. 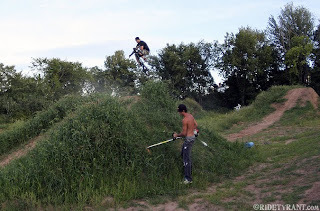 Rumor has it that Blachura us getting a mini excavator in the coming weeks and building a long line of smaller jumps...like a 10 pack or something to that effect. Dave wants to incorporate a wallride, berms, hips, etc. The Fall should be fun as hell if that line gets built!